I used to have a perfect view of these fly-overs from my classroom when I was in high school. During exam time, we were seated in alphabetical order according to our surnames - this put me right over at the window, which suited me perfectly. I've never been able to sit and do nothing for very long (my record is about 3 minutes, and I was all worn out from the exertion afterwards), so whenever I finished an exam early - which was fairly often - I'd have to invent elaborate mental games to keep myself from going crazy with boredom. 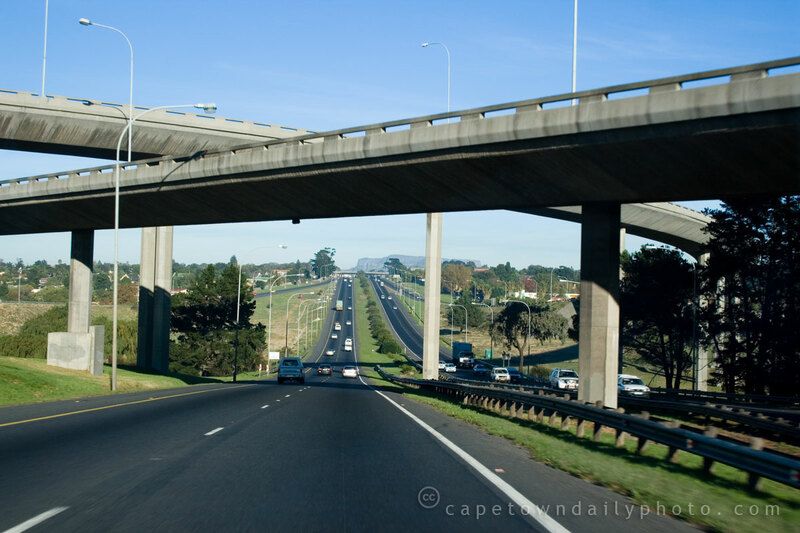 These fly-overs over the N1 were a godsend, as you can imagine, because they meant I could keep busy by counting cars. I would keep a tally of how many cars of a certain colour went past in each direction, how many trucks went past, how many motorbikes, and so on. Yes children, when we were young, back in the olden days, we didn't have fancy computer games or iPhone apps - we had to make our own fun. Posted in General and tagged history, road on Monday, 8 June, 2009 by Kerry-Anne. Now lets see what school would that be .. Stellenberg High maybe .. well you must have had good eyesight if you could count from there. Stellenberg High it was. :) And actually, I have TERRIBLE eyesight (I wear contact lenses with a serious prescription) – but it was surprisingly easy to count the moving shapes from my desk at the window. the top flyover looks as if it is almost touching the other one. I like to have a window to look out too. Hi Gerald, thanks for popping by! I can’t stand not having a window to look out of while I’m working. Fortunately I have a huge window here in my office now, so I’m happy. :) I worked in an underground office on and off for a couple of months – never again. – at least you where not texting – lol.